Gideon Lancaster betrayed both sides in the Boer War through one and the same act, and felt betrayed himself. Gideon is a Kiwi fighting with the Imperial forces against the Boer republics. 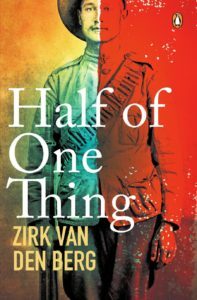 He is sent to join the fanatical Jacob Eksteen’s Boer commando as a spy. Gideon gets wounded and meets Esther Calitz, and soon doesn’t know any more where his loyalty lies. Read the reviews on Artslink, ArtSmart and M&G.